I have a book of Pulitzer Prize-winning photos. The kind that are inspiring and the kind that hurt you to look at but you must look at them anyway to feel the pain and the loss and remember that our world and its people are far from perfect. Far from civilized. We don't really get to see pictures like that anymore. Or rather, we do, but we see so many of them that such images tend to get lost in the detritus, (unless the photographer is lucky enough to be high above the detritus, like the woman who captured the shuttle launch from above the clouds). 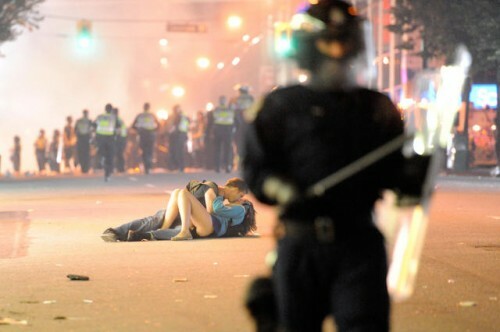 I was fortunate to come upon the image of the Vancouver Kissing Couple the day after their image went viral. By then, they had been identified and the truth about their story was being told - and even updated constantly - to diminish the notion that these were two amorous anarchists who wanted to exemplify the notion of making love, not war (it was a girl knocked over by the riot police, who's boyfriend lay down next to her to provide comfort and photographer Rich Lam, working for Getty Images, caught their moment), but more importantly, to stress that the image is not a fake. I missed the initial viralification of the image and the inevitable attempts at memage. I missed the opportunity to wonder if the image was fake; if it was staged. By seeing the image first attached to the true story, I did not get that jaded feeling that modern technology has inflicted upon us. 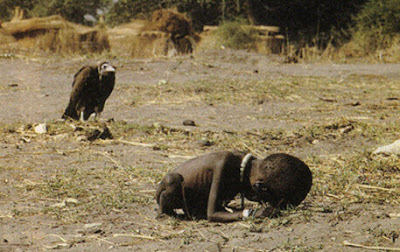 It made me sad to see so much skepticism and even condemnation, proclaiming the image a staged fake. All because we are so used to our world now being staged and photoshopped for our viewing pleasure and amusement. (1) The reality of photojournalism is that you can walk into any newspaper in the country and given the opportunity to view their hardcopy photo morgue from 30-40 years ago, you will find images manipulated by pencil, pen or marker. (2) After all manipulation of photographs has been an on going practice in the dark room since photography came into existence. Back then, the reasoning was perhaps to place a ball where a sports photographer had missed it in his shot. Cameras were much slower then and picked up less detail. We no longer have that excuse. Now photos are altered simply to exaggerate, lie or to offer proof of a lie. How can anyone tell or show the truth, if we no longer know how to believe them?